A masseria, or country house, is a good alternative lodging to stay on a vacation in Puglia. Masserie often are still working farms and they actually can produce olive oil, wine, vegetables. 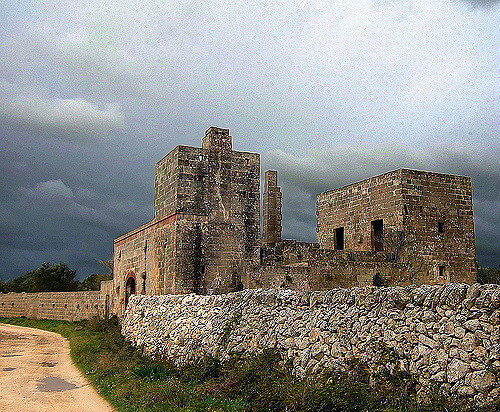 Basically, it is a fortified farm house or country house on a country estate and in Italy you can find them only in the region of Puglia. The masseria was fortified, because originally these kind of mini-manor had to resist the attacks by Turks or pirates from the sea. The masserie were built from the 16th up to 19th centuries. You can have a bed and breakfast or self-catering treatment: usually you can find also many services such as a swimming pool, a lovely garden, a restaurant which the typical dishes of Puglia. Check online for finding also the ones which offer cooking classes for guests. Many masserie are along or close to the coast between Bari and Brindisi (the masseria coast) and they are a pretty good location to visit both the beaches, the trulli of Alberbello and other incredible little towns. Alberobello is in southern Italy’s Puglia region, the capital of trulli country which are an unique architectural structures, with conical roofs made of limestone slabs. The trulli area of Alberobello (Zona Monumentale Trulli) shows more than 1500 trulli, and for this reason is well-known as one of southern Italy’s World Heritage Sites!!! Many trulli are still lived in, some are restaurants, shops, hotels and holiday houses. You can’t miss here also the scenic and large archeological site of Egnazia. To go to the Salento Peninsula is also easy: check the masserie close to the seaside towns of Gallipoli and Otranto, and the city of Lecce. This entry was posted on Monday, August 20th, 2012 at 11:40 pm	and is filed under Accommodation. You can follow any responses to this entry through the RSS 2.0 feed. You can leave a response, or trackback from your own site.